What is Backswing Golf Events? It's a company that brings good golf and great personalities, and lots of fun, to golf tournaments and events. 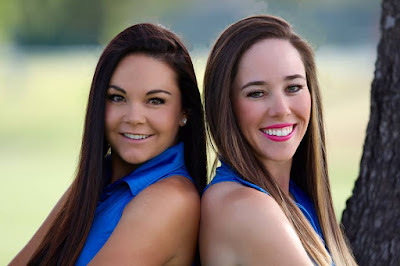 (That these golfers happen to be "golf babes" is just a bonus.) It's also a company that was founded fairly recently by two good friends making their first formal forays into the business world. All pro golfers are businessmen and businesswomen really, in women's golf, especially: there are travel arrangements to make, money to scrimp and save for entry fees, expenses to track and tame. (The PGA Tour guys all have "people" who do those things for them.) But founding their own company is a new experience for the Backswing co-founders and co-CEOs, McKenzie Lyng and Amanda Robertson. "I love it because whatever we do and however hard we work determines the outcome of how our business grows," said Lyng (you might better know as McKenzie Jackson from Big Break Mexico). "There are some things we are learning as we go, but that's the fun of it. I don't think that there's many companies who have the same business plan as we do, so, therefore, we can choose how we want to do things and I love that about starting a company." McKenzie and Amanda were doing what many young golf pros do to supplement their income: working the pro-am circuits. Personal appearances and playing appearances at corporate events, charity tournaments and the like. "Amanda and I have been talking about making what we do into a company for a long time," McKenzie said. "We have been traveling participating in Pro-Ams for about 2-1/2 years now, and finally decided to make it official this summer." That meant putting together a business plan, recruiting other golfers to join the Backswing Golf Events roster and marketing their services. What about those services? McKenzie says, "What we provide for clients is a fun, personable day on the golf course! They can take away an unforgettable memory from playing with awesome professional golfers. There are a lot of things we do to customize each event, to ensure each group has a great experience." Backswing's services can include a pre-event gala, for example, or a lunch and golf clinics. They often include Big Break-style challenges (such as the infamous Flop Wall or the glass break). The Backswing pros at an event might rotate among groups of golfers, play several holes with each group. Or there might be a Backswing pro stationed at each of the par-3 holes to interact and play the hole with each group as it comes through. Other Backswing pros include Kylee Duede, Chelsea Kinard, Candra Sumedhatip and Melissa Mabanta. So if you're involved in planning a golf event, be sure to check out the Backswing Golf Events website. You can also find them on Facebook, and the founders are on Twitter: @McKenzie1207 and @TeamAmanda295.